Hearts have announced a new kit partnership with Umbro for the forthcoming 2017/2018 season. 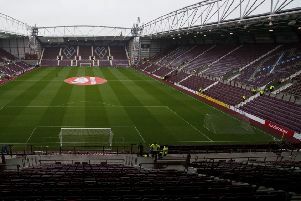 The Gorgie side return to the double diamond having previously enjoyed two spells with the Manchester-based kit supplier. The last time the club donned the Umbro design was for the momentous Scottish Cup victory in 2012 when they defeated rivals Hibs 5-1. That specific tie-up began in 2007, while the first time the club linked up with the manufacturer was in 1975, lasting until 1986. Umbro will produce all on-pitch and training products as well as sportswear for fans and players. Ann Budge, Hearts’ chairwoman, said: “Umbro is a leading global sports brand and we at Hearts are delighted to be associated with them once again. “We have worked closely with Umbro to provide supporters with new kits and an exciting product range, which will be revealed in the very near future. Anthony Little, Umbro’s managing director, added: “Hearts is a club with fantastic history, not just in football but also with Umbro, last lifting a major trophy wearing the double diamond in 2012. It will be great to see them back in our kits when the 2017/18 season kicks off. The home kit will be on sale in June with away and third kits to follow.